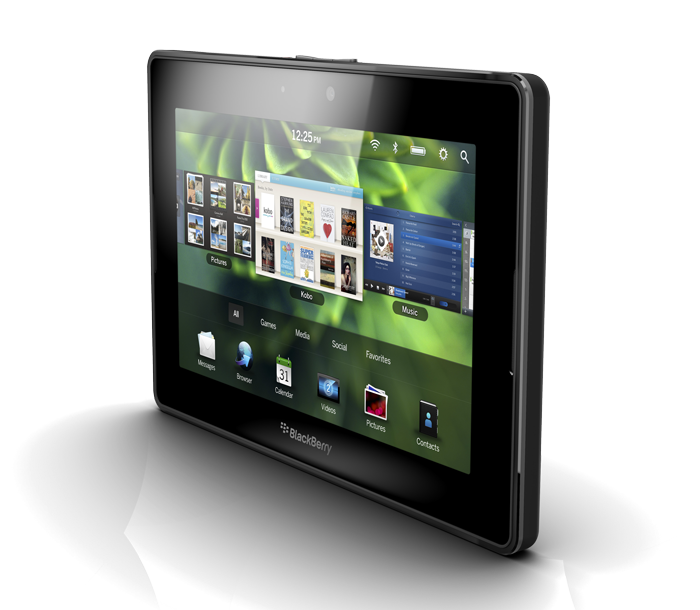 The 7-inch PlayBook, RIM's answer to Apple's iPad, launched in thousands of stores on Tuesday and "mostly stayed there," with many stores unable to sell through their stock of 5 units, Reuters reports. According to The Wall Street Journal, several retailers saw modest sales of the device throughout Tuesday. A few stores in Toronto and New York reported that a few people had waited in line on Tuesday morning to purchase the PlayBook. Last week, advance reviews of the PlayBook criticized the device as being "unfinished" and recommended that customers hold off on purchasing until RIM adds features later this year. RIM co-CEOs Jim Balsillie and Mike Lazaridis quickly spoke out in defense of the PlayBook, calling reviewers' assessments unfair. The PlayBook is priced to compete with the iPad. The 16GB Wi-Fi only version sells for $499, with 32GB and 64GB models going for $599 and $699 respectively. RIM has revealed that a 4G cellular data version of the PlayBook will come to the Sprint network this summer. Analysts remain skeptical about the PlayBook's likelihood of success, with a consensus estimate of 3 million units sold in 2011. "It's going to be a tough sell to the consumer," BGC Partner analyst Colin Gillis said. "It's not going to be in the same league as the iPad," said IDC analyst Al Hilwa. "The question is will it sell more than the [Motorola] Xoom but less than the [Samsung] Galaxy." Shares of RIM fell 2.94 percent on Tuesday, closing at 53.22 on the Nasdaq. The muted PlayBook launch contrasts sharply with last month's launch of the iPad 2, which drew record lines. Supply of the iPad 2 has remained scarce for over a month, though Apple was able to stick to its scheduled international launch on March 25, unlike last year with the original iPad. On Sunday, Toys R Us and Best Buy both held promotions for the device, despite having limited stock of the tablet. Intel surprised Wall Street on Tuesday with record first quarter revenue. The chipmaker reported net income of $3.16 billion, up from $2.44 billion in the first quarter of 2010. The company's revenue soared to $12.85 billion on 25 percent growth, besting consensus estimates of $10.8 billion to $11.6 billion. During a conference call to discuss the earnings, Intel CEO Paul Otellini admitted that, as expected, consumer demand in the U.S. and Western Europe had been "soft," but noted that emerging markets and enterprise servers had outperformed expectations, according to Seeking Alpha. Several of Intel's businesses, including Data Center, Embedded and the Digital Home Group posted impressive growth for the quarter. The Data Center Group recorded revenue of $2.5 billion in the first quarter of 2011, with 32 percent growth year over year. Intel reported "outstanding" demand for its new line of Sandy Bridge chips. Apple added Sandy Bridge Core i5 and i7 CPUs to its MacBook Pro line of laptops in February. NPD estimates that the new MacBook Pros contributed to 47 percent growth in U.S. Mac sales in March. Otellini remained optimistic about Oak Trail, the company's just launched tablet chip. "Over the course of this year, Intel will have tablet platforms that run Windows, Android and MeeGo," said Otellini. "We're heads down on a number of designs on tablets on all three of those operating systems," adding that Intel had obtained the Android 3.0 Honeycomb source code from Google and was working on porting it to work with Intel's chips. Intel also reiterated its commitment to a smartphone chip solution. Otellini said last December that "premier branded" smartphones sporting Intel's chips are scheduled to arrive in the "second half of 2011." During the call, Otellini took issue with PC growth forecasts from firms like IDC and Gartner, calling them "all over the map." Otellini sees "low-double digit" growth for the PC market in 2011, compared to Gartner's forecast of 11 percent and IDC's estimate of 6 percent or 7 percent. When asked whether tablets such as the iPad had softened demand for PCs last quarter, Otellini admitted that tablets had cannibalized PC sales "a little bit," while pointing out that macroeconomics and the post-recession upgrade cycle are bigger causes. Shares of Intel jumped close to 5 percent in after-hours trading late Tuesday.